The success of HIT is attributed to its motivating and inspiring faculty members. 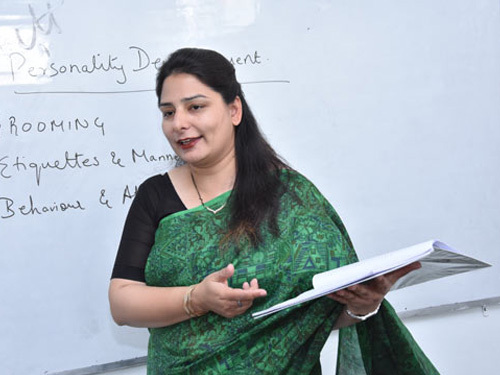 Our faculty members are expert professional educators.They are specialists in their fields. At HIT, faculty members are committed to students' achievement. They invest one-on-one time to identify talents and nurture abilities of students. Their personalized approach often results in success never initially imagined by students. Faculty treats students as their children and is always ready to provide support in terms of educational guidance and morale. Weak students are identified and are given special attention and extra time for improving on their weakness. HIT has a very strong team of the faculty members. It is our constant endeavor to improve the quality of the students' academic level by assuring continuous learning and development of our academic staff. We disseminate good practice in teaching, learning and assessment as identified through internal evaluation processes and quality assessment mechanisms. HIT's Faculty members focus on development and strengthening system thinking, problem solving, analysis, design, research, team work, communication skills, and readiness for lifelong learning. The academic learning comprises of mixed techniques of interactive lectures, guided case studies, literature surveys and project work that require team work and critical and creative thinking. The quality policy is to pursue global standards of excellence in our endeavors and to remain accountable through processes of self evaluation and continuous improvement. Through a team of more than forty faculty members, HIT puts a great emphasis on class room, laboratory and project work. While these activities are also used for developing skills to apply various concepts, tools and techniques, their main purpose is to develop the core technical as well as general professional competencies through experiential and collaborative learning. Main purpose of HIT Education is to develop the abilities to design and conduct experiments; collect, analyze and interpret data; work independently and also in teams; and to improve reporting and communication skills too. HIT has a strong policy of Faculty skills development. Our Academic staff is leaders in their fields, selected from prestigious institutions throughout India. HIT invites prominent speakers from Government and Private organisations, who enlarge the learning scope of the students. The Institute brings together some of the leading professionals in their fields of expertise for exploring the current and future issues with the students through their research and experiences. The visiting faculty are from top organization like IIT, IIM, JNU, TCS, INFOSIS, WIPRO, Taj Group of Hotels, Hyatt, The Leela, ONGC, FRI, HNBG University, Delhi University etc with rich and varied corporate experience. The students get a different insight into the subject with the rich industry experience that the faculty shares with each of them.